Tiny Wings has been a mainstay in the App Store’s charts for top-selling iPhone games, but I have to confess that it’s managed to fly beneath my radar for too long. Let’s chalk this up as a case of “better late than never” as the game from Andreas Illiger really showcases how a simple game can really take flight on the iPhone. In Tiny Wings, you control a squat, big-eyed bird with an unfortunately limited wingspan as he slides along an undulating landscape, hoping to take flight. Gravity may be working against you, but fortunately, you’ve got Newton’s First Law of Motion in your favor. Hold your finger to the iPhone’s screen, and the top-heavy bird stops flapping his wings; release your finger, and the flapping resumes. The idea is that as your bird slides down a hill, you hold down your finger to pick up speed, releasing at just the right moment so that your momentum up a slope propels you into the air for a few glorious seconds of flight. Time it right often enough, and your little bird remains airborne for a little longer each time; tap the screen too early, though, and your forward momentum will come grinding to a near halt. Don’t Let the Sun Go Down on Me: Your mission in Tiny Wings is to use momentum to propel your flight-challenged bird as far as possible before the sun sets. If all this sounds simple, that’s because it is—you’re bouncing from hill to hill and island to island, trying to go as far as possible before the sun sets and your bird drifts off to sleep. Along the way, you rack up bonus points for longer jumps, vaults into the clouds, and coins you collect during your travels. But if the iPhone has taught us one thing, a simple game doesn’t have to be disposable. Tiny Wings is sneakily challenging and frighteningly addictive. While the gameplay is just the right length to pass the time while waiting in line, you’ll find yourself launching Tiny Wings again and again, if you’re anything like me. Part of that addictive gameplay comes from a series of mini-challenges Tiny Wings throws at you throughout the game. Complete a series of specific objectives (collect a set amount of coins, launch your bird into the cloud a certain number of times or—in a monstrously demanding twist— reach the fifth island while playing the game upside-down), and Tiny Wings will boost the multiplier it applies to bonus points. The ongoing challenges help Tiny Wings feel fresh, even if you’ve played it dozens of times. Also helping keep things fresh is the game’s unique look. 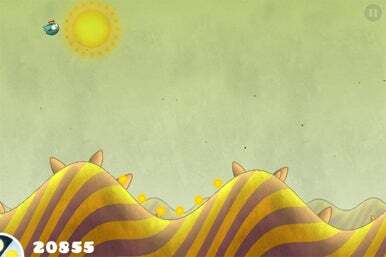 The hills in Tiny Wings offer a pleasing blend of colors and patterns. And Andreas Illiger changes things up by using procedural generated graphics—the colors and the patterns change every day, giving each island a different look. I have a few quibbles with the game. Tiny Wings places its pause button at around the same spot that I like to place my finger for managing my bird’s flight pattern; I wound up pausing the game a lot when what I really wanted to do was help my bird slide down a hill. I’ve since adjusted the way I play the game to dramatically cut down on inadvertent pauses, but it’s still an issue some iOS gamers might run into. A more notable issue involves those eye-catching graphics and their effect on the game’s performance—because Tiny Wings is constantly in motion as your bird slides from hill to the next, it seems like there’s more demand put on your iOS device’s processor than you might expect for a casual game. Whatever the reason, a few times I saw some lags or stutters in performance—nothing significant, but certainly noticeable in a game that relies on timing for you to succeed. I did test Tiny Wings on an older iPhone 3GS, so it’s probable that users with the more powerful iPhone 4 or fourth-generation iPod touch won’t run into the same occassional performance lag that I did. Still, that’s a relatively minor complaint that shouldn’t detract from an outstanding entry into the world of iOS gaming. If you’re not among the iPhone and iPod touch users who have propelled Tiny Wings to the top of the App Store’s gaming charts, join the party today—this is an instance where the wisdom of crowds is dead-on.